Autism affects 1 child in every 110 children. 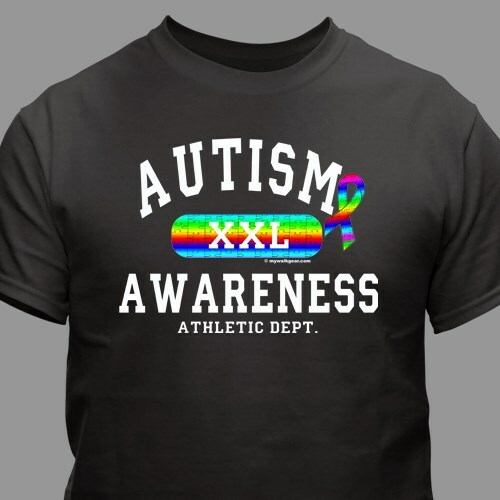 Be a part of raising awareness and support the Autism & Asperger's community with our Autism Awareness XXL Athletic Dept. T-Shirt. This wonderful design features bright colors for joy and optimism and the puzzle pieces illustrate the complexity of this condition that has changed the lives of so many families. Show your support in every way possible each time you wear your new Autism Awareness T-Shirt. Our colorful Autism awareness shirts are available on our premium 100% cotton T-Shirts, machine washable in youth sizes XS-L & adult sizes S-3XL. It is a very nicely made shirt. Seem to be very nice. Fit well, but have not washed them. Additional Info Wearing Personalized Autism Apparel is a great way to promote acceptance and understanding of autism. They are great for showing your support during awareness walks and they raise awareness to those around you. Join in and support the need for continuing research for treatment for Autism and Asperger's disease by wearing your Autism Awareness Apparel proudly. You may also enjoy outfitting your entire Autism Walk Team with our Personalized Autism Support Hat and our Personalized Walking for Autism Water Bottle.